Jared Allen has been relatively quiet this season, after an offseason in which the NFL made him alter his sack dance, he cut his hair for his wedding, and he attended his wedding which of course means he got married. 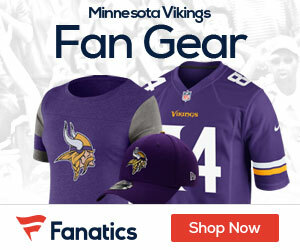 With Vikings fans hoping that he can make a splash on Sunday against the Packers (7.5 sacks against the Packers last season) Allen is also making a splash off the field by publishing his very own cookbook. The title? 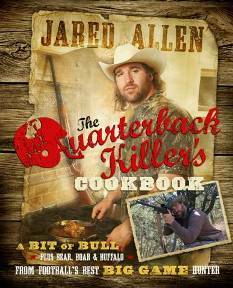 The Quarterback Killer’s Cookbook: A bit of bull, plus bear, boar and buffalo. In the book, the well known hunter provides you with uses for wild game of all sorts. Allen says that his favorite dish is the pheasant nuggets. If one of you readers buy his book, let me know if it has a great Ptarmigan Stew recipe or even a good recipe for Ermine Ribs… then I will have a use for it. Lets all just hope Allen got all this cooking out of his system so he can get back to quarterback killing. hopefully he goes hunting for Rodgers, they’re in season. Can’t help you on the Ermine ribs Adam, but I’ll tell you, I am THE king of Ptarmigan Stew. And don’t even get me started on Ptarmigan ala’ Boo. . .
Fran, have you Alaska guys ever eaten that rotting salmon thingy? Not I. Had salmon a lot of ways… rotten is not one of them. I’m not sure what that “rotting salmon thingy” is Ole. Unless you’re talking about the time my Dad left a couple of salmon fillets out in the sun for several hours and then my mom popped them on the grill that night. . .turned the living room into a sort of old style Roman vomitorium. Pheasant nuggets are awsome, Jared is right. For sure, no doubt about that, Johnny. Speaking of, had yourself some luck down there in Iowa in the pheasant hunting department this year? Adam, pheasant season doesnt start for another week and the numbers are way down this year. Too much rain and flooding but I have spotted a few here and there to fill the crockpot. WEll, good luck and be safe. I dont know about Minnesota but Iowa is usually the first Saturday in November so it’s actually early here, Oct. 30th. Here you go, pheasant hunters. All you want to know, and more. I recommend Prairie Oysters. Had them at the Calgary Stampede, surprisingly good. please tell that is sarcasm. please?